The Steppe Bison lived during the Pleistocene Period (about 2 million To 10,000 years ago). It was one of the most common species from Eastern Beringia (unglaciated parts of Alaska, Yukon and Northwest Territories). 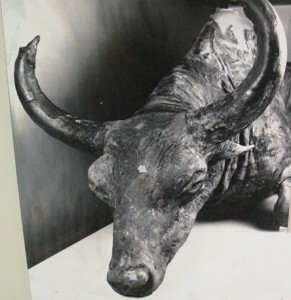 Images of the Steppe Bison appear in Stone Age cave images in Europe. Preserved carcasses have also been found. Perhaps the most famous is “Blue Babe”, a nearly complete 8-9 year old male carcass, found at Pearl Creek, near Fairbanks, Alaska in 1979. The specimen was carbon dated to about 36,000 years ago. Blue Babe’s weight was estimated to be 700 – 800 kg. It was a rich, dark brown color. Partial carcasses of other Steppe Bison have been found in the Yukon, Alaska and Siberia. Among the best preserved specimens are from bones found in the Old Crow Basin. The find includes skeletal parts, and skulls. Indications are that the Old Crow Steppe Bison died about 12,000 years ago. The Steppe Bison was characterized by its large size, long hindlegs and large horns. The horns had tips that curved back. The Steppe Bison lived mostly on low-growth herbs and grasses. The rapidly changing climate towards the end of the last glaciation resulted in the replacement of the steppe-like grassland range by boreal forest and tundra. These changing conditions and human and animal hunters most likely helped to accelerate the extinction of the Steppe Bison.